After a long hiatus, I finally managed to get back out under the stars to capture some faint fuzzies again. Being the time of year where Orion is sitting high up in the South for much of the night, I decided to go for my old favourite, the Horsehead Nebula, and it’s stablemate, the Flame. These extend vertically downwards from the left-most star of Orion’s Belt, Alnitak. 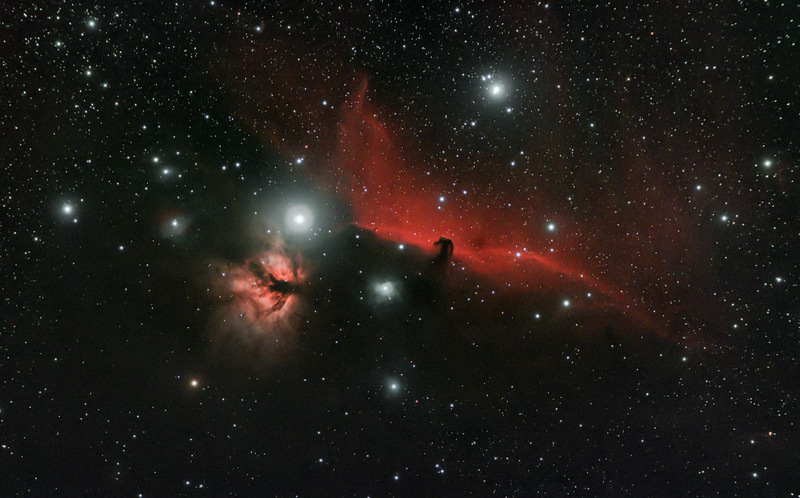 They are extremely difficult to see visually, with a very dark sky needed, and in the case of the Horsehead itself, a Hydrogen Beta filter is usually needed to make it out at all. This was captured at the SEKAS (South East Kent Astonomical Society) dark(er) sky site, near Canterbury. Getting out and away from the City lights helps greatly when capturing those elusive photons, and having a reasonably dark place to go is always a bonus. Can’t think of another hobby that involves sitting with several people in a freezing cold field (yes that is frost on the grass in the picture! ), drinking flasks of tea and waiting around while photons of light that left their home 1500 years ago end their journey exciting bits of a slab of silicon behind a set of lenses. After some initial issues getting set up and aligned (okay, okay, it’s been a while! ), said useful photons in this case took about 55 minutes to capture (11x 5 minute sub-frames) at ISO 800 on my astro-modified Canon 1100D, fitted with an Astronomik CLS filter. The telescope was an Ikharos ED70 doublet at F5, mounted on a Skywatcher HEQ5 mount. 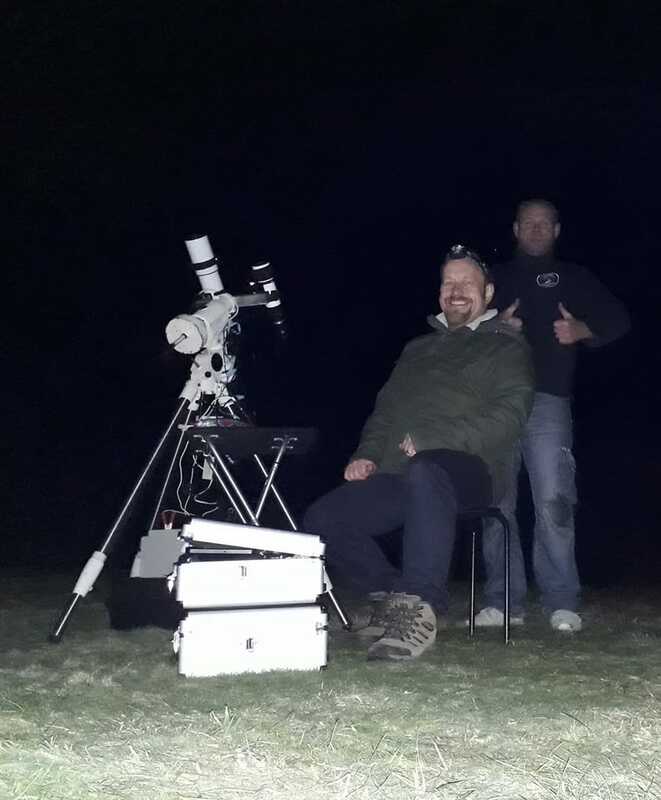 The whole shebang was guided by a 60mm Altair finder-guider with a Starlight Xpress Lodestar hanging off the back. The Capture software was good old APT (Astro Photography Tool). Once captured, along with Darks, Flats and Bias frames, the data was stacked and pre-processed in MaximDL 5, then further processed in Photoshop CC and Lightroom CC. I actually captured about 10 more subs than this, but unfortunately, aircraft and intermittent high haze intervened to spoil them, so I was left with 11 in total. All-in-all a really enjoyable night…! Seriously Adam? enjoyable night! or productive night? how did you endure the cold but more importantly avoid the condensation? Much as I love this hobby, I just can’t bring myself to do what you describe as enjoyable. But you have shown us what can be achieved with modest equipment if I may say so. Thanks.